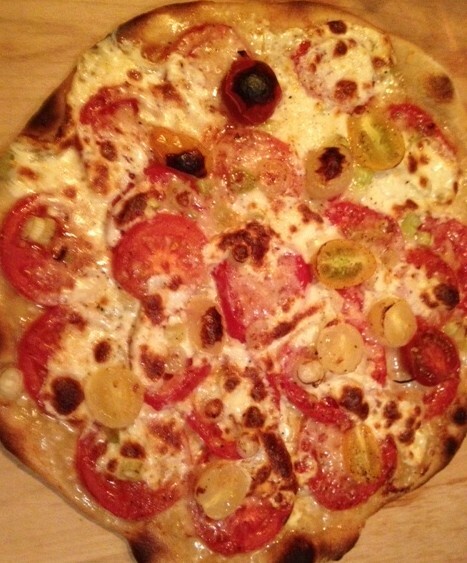 My friend Vino makes the best thin crust pizza – it’s crispy, bubbly and cheesy. This summer I practiced Vino’s process of dividing a dough ball into smaller dough balls to create the desired “thinness”. This recipe will make two or three pizzas, depending on your definition of thin. Like Vino, I buy dough balls at Serpes Bakery in Elsmere, Delaware. If Serpes is not in your neighborhood, you should be able to find similar dough balls at your local Italian bakery. Divide the dough ball into two or three pieces, and form the pieces into smaller balls. Let these rise under a kitchen towel to three times their original size. At this point, “punch” down the balls and use a floured rolling pin to roll out each ball into a round crust about 12 inches in diameter, incorporating flour and stretching the dough as you roll. You can store these pizza crusts in the freezer for later use. In fact, the crusts slide off the pizza peel more easily if they are frozen. To make the marinara sauce for the pizza, heat a few tablespoons of olive oil and three cloves of garlic in a pan over medium heat until the garlic is pale gold. Add the strained tomatoes, and add salt and pepper to taste. Add some freshly chopped basil and stir with a wooden spoon. Bring the sauce to a bubble and then turn down the heat to simmer. Place a pizza stone on the grill or in the oven and preheat to about 550 to 600 degrees. When the stone has reached the desired temperature, remove the crust from the freezer. Place the crust on a pizza peel that has been dusted with flour to ensure that the pizza slides onto the stone. Ladle sauce over the crust, then top with the mozzarella and chopped scallions. Slide the pizza onto the stone and cook the thinner crust for about 5 minutes and the thicker crust for about 7 minutes. The pizza is done when the crust is crisp, bubbled and browned. Remove the pizza using the peel and place it in a large round platter to slice. Repeat with the second crust, but top this pizza with sliced tomatoes and a combination of mozzarella and Gruyère as well as scallions. If there is a third, consider a combination of sauce, mozzarella, Gruyère and any other cheese in your cheese drawer – Manchego, perhaps? This entry was posted in Uncategorized and tagged Cooking, Dough, Food, Italian, Pizza, Recipe, Sauce. Bookmark the permalink.